The Jubilee United Church was filled with excitement. 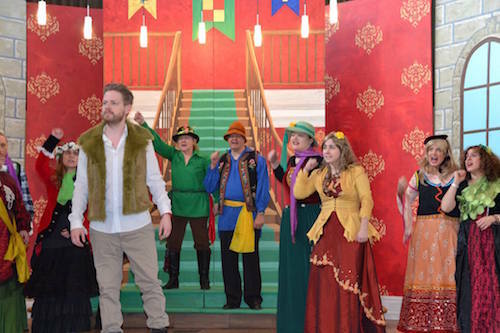 The North Toronto Players were celebrating their 50th anniversary with a special gala performance of Chelsea Moor Castle (or, The Contract To Marry). The attendees were dressed to impress and eyeing the stage with eager smiles. I was swept up with the buzz of the crowd, ready for a performance worthy of the big 5-0. Chelsea Moor Castle (or, The Contract to Marry) is an original show inspired by WS Gilbert and Arthur Sullivan. The script and lyrics were written by stage director Michael Harms and actress Barb Scheffler. The playwrights were compelled to answer the question “What would Gilbert and Sullivan do if they were writing a show today?” Their collective response results in an operetta full of secrets, love, and death. The show begins with the servants of Chelsea Moor Castle who meet the closest heir to their previous master, who succumbed to the Chelsea Moor Castle curse and died after falling off a parapet. The heir to the castle is Tom Jones, who isn’t accustomed to the duties of the upper class. After his arrival, Tom is visited by Lady Delilah Bilkington, Duchess of Forest Hillington-shire, and her daughter Millicent. Lady Delilah announces that Tom must carry out a marriage contract the previous Earl signed and wed her daughter. What Millicent and Tom do not know, is that Lady Delilah set up the marriage contract to inherit the wealth of Chelsea Moor Castle. It seems that if Tom and Millicent stick to their duties, her scheme will work and Tom’s riches will be hers. This description is only the set-up of the play. The drama builds to new heights with every passing minute. It rolls into the ridiculous, as if the show is trying to upstage itself. First, we have schemes for gold, a marriage announcement, and a confession of secret love. Then, there are ghosts that haunt the castle at tea-time, as if the Chelsea Moor curse wasn’t enough of a supernatural problem. I loved how much they upped the ante into the realm of absurd. It was incredibly fun to watch. It made me thrilled for what was happening next. The most shocking thing about the show wasn’t the tea-time spectres or the romantic scandals, but the singing. I was surprised at the calibre of the performers on stage. Even with the lyrics describing ludicrous situations, there were moments were I was in awe of the voices ringing through the theatre. An absolute stand-out was Alison Boudreau as the daughter Millicent Bilkington. Her voice was light and sweet, but carried the power to silence a crowd. Barb Scheffler as the ghost Felicity was also a joy to witness. Her voice was incredible, and her role as the castle spectre was my favourite in the show. I think it’s a testament of her talent that I cared the most about a dead character, than for living one. My only issue with the show is that there were a lot of inside jokes. The North Toronto Players were obviously part of a tight-knit community, which is a wonderful thing to see. The play was full of inside jokes and call-backs to previous performances, which made many of the audience members burst into uproarious laughter and cheers. Unfortunately, I’m not part of that community, so quite a few of these jokes flew over my head. Missing these jokes didn’t ruin my enjoyment of the play, but the confusion was a distracting. If you’re not a part of the community, you might feel a little left out. In the end, this show was a great time. The stage was full of drama, love, and song. The best thing about the show is its fullness: the stage was crowded with performers, the theatre was vibrating with voices, and the script was stuffed with plot. It was impossible for me to not feel satisfied after such a bountiful experience. I recommend you see this play and see the abundance the North Toronto Players have to offer. Chelsea Moor Castle (or, The Contract to Marry) is playing at the Jubilee United Church (40 Underhill Drive) until March 13th. Remaining performances are Friday March 11th and Saturday March 12th at 8:00pm. Saturday March 12th and Sunday March 13th have matinees at 2:00pm. Ticket prices are $25 for general audience members, while seniors are $22 and students for $15. Tickets for children under the age of 14 are free. General tickets can be purchased online or at the door. Tickets for seniors/students/children can be purchased by phone at 416-481-4867 or at the door.